Is this a sign of a shift in the Santa Clarita real estate market? The Southland Regional Association of Realtors released their statistics for the month of May, revealing that single family home prices made no gains over April. Santa Clarita Real Estate UpdateCurrently single family homes are holding at a median price of $485,000 in the Santa Clarita Valley. Condominium prices in the SCV did bounce upward nearly 6 percent last month, settling in at $281,000. Condos have had a bumpy ride in the past year or so, with a few ups and downs along the way. They had topped out briefly at $295,000 in November 2013 before taking a dip at the beginning of this year, but overall their median equity has increased by over 12 percent since January. Condos may have gained more appeal in light of the fact that single family homes are becoming out of reach for many entry-level home buyers. A more balanced Santa Clarita real estate market? It is worth noting that home values don’t always jump from month to month. Between March and July of 2013 we saw median prices for single family homes bounce back and forth between $420,000 and $430,000. That being said, the market was a bit different this time last year, with about only half the amount of homes available for sale compared to 2014. 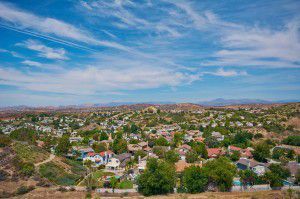 The Santa Clarita Valley currently has just over 800 homes available for sale, giving buyers a few more choices not only in selection, but in the negotiation of terms as well. Interest rates are also remaining low, hovering in the low 4 percent range as of the close of business on Friday, June 20. Rates and market conditions remain steady despite another cut in Quantitative Easing stimulus funds from the Federal Reserve. Montemayor and Associates are your choice when it comes to real estate experience and expertise.